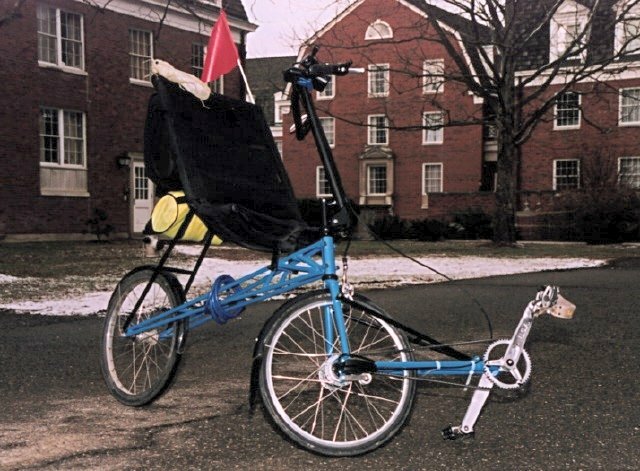 In 1996, Issy Urieli sent Brian Wilson photos of his bike Grasshopper and he scanned them in. It's a small, front wheel drive recumbent bike with a mesh seat. This is Izzy and the bike. This is a shot showing only the bike. This is a close up of the drive system. Beautifully crafted - highly professional work. They are mainly involved in electric motorcycles. The belt: Gates Poly Chain GT - 8mm pitch, 10mm width. The teeth are in fact the rounded teeth, and the tensile braided cords (which give it the tensile strength) are made from an aramid fiber. In spite of the fact that there are no guiding walls (except for the small idler) the belt shows no tendency to fall off the sprockets. It is important to have it well aligned on a stiff frame. Sachs Super 7 internal 7-speed hub. For some reason, Sachs is not promoting this excellent gear hub for US use. Difficult to come by. I got mine from Gaylord Hill in Cyclopedia - Wonderful to use single lever hub - it is not sealed, but I wouldn't even begin to know how to oil it - apparently you just use it and use it without ever having to adjust it. Moulton 17" wheels - the rims are drilled on special order to 36 holes by Doug Milliken. Does a fine job and the wheels were easy to assemble and true. Doug also supplies Moulton tires, tubes, and ither accessories. Doug is from Buffalo, NY, but I have left his email address at home. The gearing that I have chosen is from 24" to 67" - obviously not for Zach, but at my age it is an absolute boon for the VERY hilly Athens, Ohio. This is done with 52-22 ratio chainwheel to sprocket, and gives me 40" for the most efficient direct drive fourth gear. This works out very well for my daily commute. The frame is chrome-molly, tig-welded by a professional. The most important part of building a bike like this is building an accurate metal jig. Mine is based on a 36" x 4" x 1/2" ground steel plate, which I use for doing all the components. A tubing notcher is also very useful for accurately fitting the metal pieces in the jig. Powder coated oven baked in azure blue and motorcycle black - I have landed up with my dream - an oil-free-pack-in-a-duffle-bag-FWD-grasshopper .. The ride is wonderful - absolutely quiet and oil-free. I suppose that there is some loss in efficiency, just based on the feel when you try to freewheel the pedals, but I cannot quantify it, and in my commuting mode I find it perfectly satisfactory. 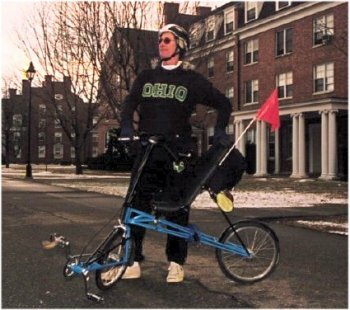 I am geared very low to combat the very hilly area in Athens, Ohio. Subject: [hpv] Hands off riding with FWD? Hi, I have been riding a FWD with pedals on the forks for a few years now, and I must take issue with Sean Costin's comment. My latest Grasshopper has about 72 degrees head angle - nevertheless I can start from stop (uphill if need be) no handed and with very little steer. Certainly while riding with powerfull strokes I can stay on a very reasonable straight line. It is only a matter of getting used to the seemingly impossible combination of steering, pedalling, and maintaining balance - all with ones feet. 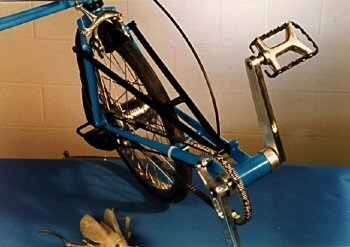 It takes at least a year to become as natural with this system as with the conventional one, but its worth it I agree with Sean that the arm crank should be attached to the steerer tube for both arm and leg cranking. I do like to have my arms on the steering arm, in spite of the fact that I only really use them occasionally. Good luck - it sounds like an interesting worthwhile project. I would love to try the system out when you build it. I have been using toothed belts everywhere I could, because they work so well and don't require lubrication. I use a type called HTD (High Torque Drive) made by Continental, which use round teeth and can apparently handle greater forces than the old.fashioned trapez-tooth design. These come in metric sizes with 3, 5, 8, and 14 mm pitches. I use the 3 and 5mm sizes. The 3mm size is really thin and flexible, so you usually need a wide belt (25mm) to transmit human-type torques (the limiting factor is always the small tooth-wheel). The 5mm size is more robust and I use the 5mm size where width and cost is a factor, as then a 15mm wide belt is usually sufficient. I am not certain which is more efficient, the wide thin belt or the narrow thicker belt. The Continental belts are made of rubber with a Kevlar or somesuch tension member. Other makes use a polyurethane/steel combination. The small tooth-wheels are easily made oneself by buying a length of aluminium profile with the required number of teeth and parting/turning down on a lathe. The biggest job is attaching or even making the flanges, which are necessary. The large tooth-wheels are also easily made from plywood and attached to pedal cranks. They don't always require teeth or flanges. If teeth are required, they are easily made by waxing the belt, applying runny epoxy putty to the disc, and wrapping the belt around, thus casting the teeth in two stages. If you do this, you have to get the diameter just right. Or use two discs of different diameters, one is the disc, the other the flange, and insert a few nails as occasional teeth. I have used such drives extensively on boats (advantage no rust) and hybrid vehicles (advantage no oil) and they work well if you design more or less by the book (available from the manufacturers) and get the tension right. I used to drive a DAF 33 car, which had two independent CVT belt drives for each rear wheel. This was better for traction than either a differential or a locked differential. Also you couldn't get stuck if a belt parted, not that this ever happened to me. I later had a DAF 46, which unfortunately had a single belt and diff. Both these cars were really easy to drive and had very good mileage (under 5 liters gasoline per 100 km). The belts were controlled by a kind of mechanical analog computer consisting of centrifugal weights, springs, and vacuum cylinders with valving. I think this system was ideal for cars and it is unfortunate that the power-mad public didn't take to such vehicles, forcing DAF to discontinue making cars. I believe they still make trucks, but withoout CVTs. I think the system is probably just a bit too inefficient for an HPV application, mainly at the extreme ratios which would be required. I have seen the Conrad CVT unit: this is a tiny high speed device of no use at all except with high speed motors.